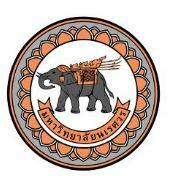 Naresuan University (NU) is conveniently located in Phitsanulok province in the lower North of Thailand. It plays a significant role in contributing to the national educational effort and maintains a strong reputation as one of the top government educational institutions in Thailand. NU believes that high quality academic programs and life-long learning will bring International Recognition to the University. Named after the Great King Naresuan, Naresuan University was developed from a College of Education in 1967 and later established as the Phitsanulok Campus of Srinakharinwirot University in 1974. The university was officially granted university status on July 29, 1990 and the name “Naresuan University” was graciously given by His Majesty King Bhumibhol Adulyadej. Naresuan University has been emphasizing decentralization of education and equality of study opportunity for people in the lower north part of Thailand and other regional provinces. In pursuit of a ‘free from ignorance society,’ the university has pledged to fulfill the following four key missions; well-qualified students, research excellence, a wide range of academic services, and arts and culture conservation.